Rajasthan forms north-western part of the Indian Shield. The State exposes a variety of lithological and tectonic units ranging in age from Archaean to Recent times. 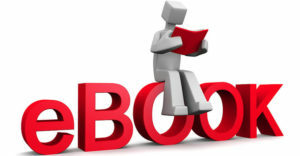 Before going into details of Geology of Rajasthan, let us first see, geology time in general to make sense of terms in geology. 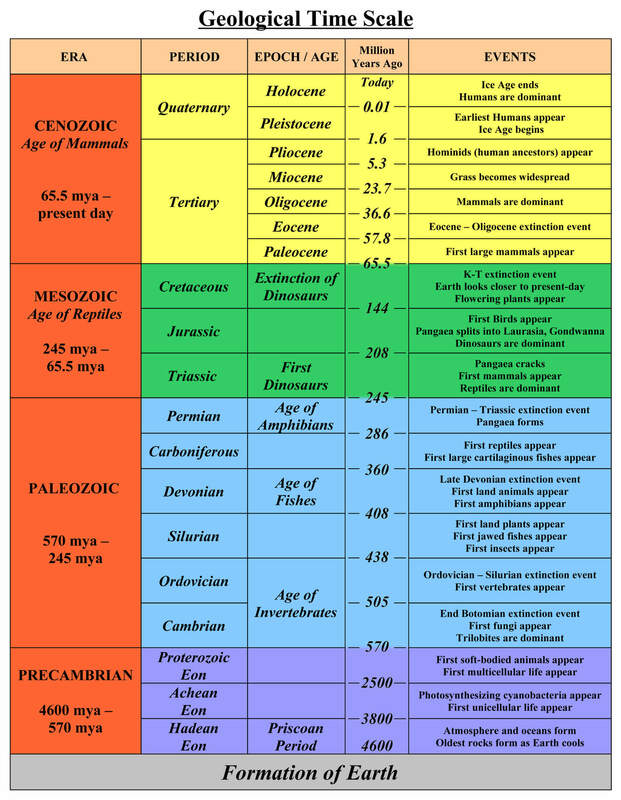 Age of rocks is given in million years age (Ma). 1 Ma = 10,00,000 years old. 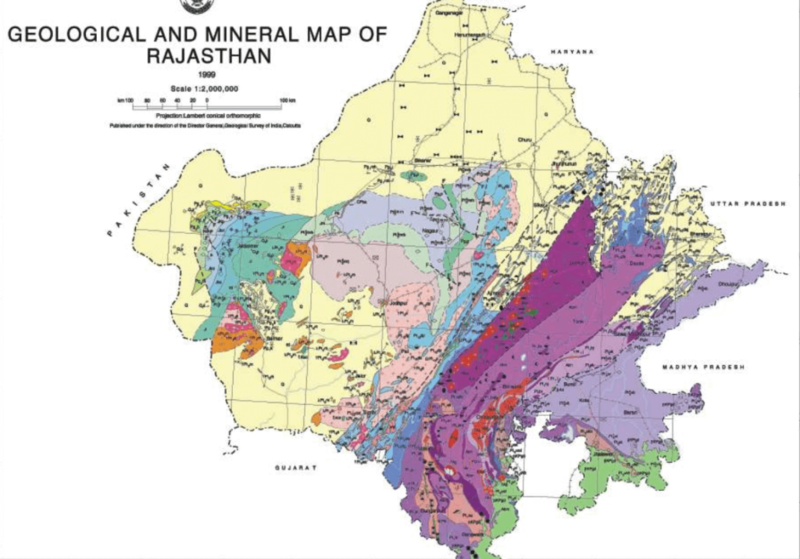 Rajasthan is endowed with a continuous geological sequence of rocks from the oldest Archaean Metamorphic, represented by Bhilwara Supergroup (>2500 m. y.) to sub-recent alluvium & wind blown sand. The geological sequence of the state is highly varied and complex, revealing the co-existence of the most ancient rocks of the Pre-Cambrian age and the most recent alluvium as well as windblown sand. The basement rocks – the Sandmata Complex, Mangalwar Complex and Hindoli Group of Bhilwara Supergroup – occupy central and south-eastern plains. They are Archaean in age and comprise in general, granulite-gneiss; amphibolite, metapelite, paragneiss, calc-silicate rocks and greywacke (the older granite-greenstone belt) and metavolcanic, metagreywacke (the younger granite- greenstone belt) respectively. 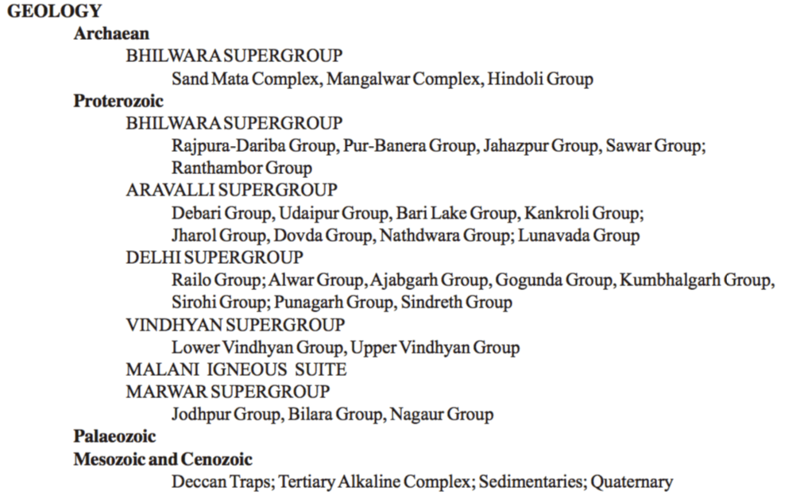 The Lower Proterozoic supracrustal rocks of the Jahazpur, Rajpura-Dariba, Pur-Banera and Sawar Groups of Bhilwara Supergroup rest on the basement rocks of the Mangalwar Complex and host a number of lead, zinc and copper deposits. 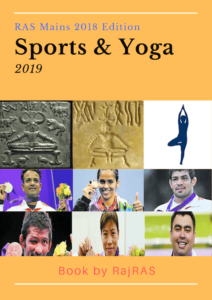 The Proterozoic fold belts, viz., the Aravalli fold belt (the Aravalli Supergroup) and the Delhi fold belt (the Delhi Supergroup) occupy the southern and south- eastern, and south-western and north-eastern Rajasthan respectively. The Aravalli Supergroup is represented by metamorphosed and complexly folded clastic sediments with minor chemogenic and organogenic assemblages with interlayered basic volcancics, whereas the Delhi Supergroup comprises mainly carbonates, metavolcanics, metasammites and metapelites, intruded by magmatic rock of Phulad Ophiolite Suite and syn-orogenic granites of Sendra- Ambaji, Bairath, Dadikar, Harsora, etc. A number of base metal deposits are located in these belts as also other minerals. The isolated hillocks of western Rajasthan constitute the Upper Proterozoic Malani Igneous Suite and the Erinpura Granite pluton. 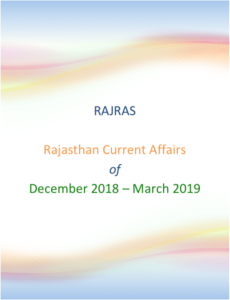 Eastern Rajasthan is characterised by the vast sedimentary stretch constituting the Vindhyans, which is juxtaposed against the rocks of the Bhilwara Supergroup along the Great Boundary Fault. 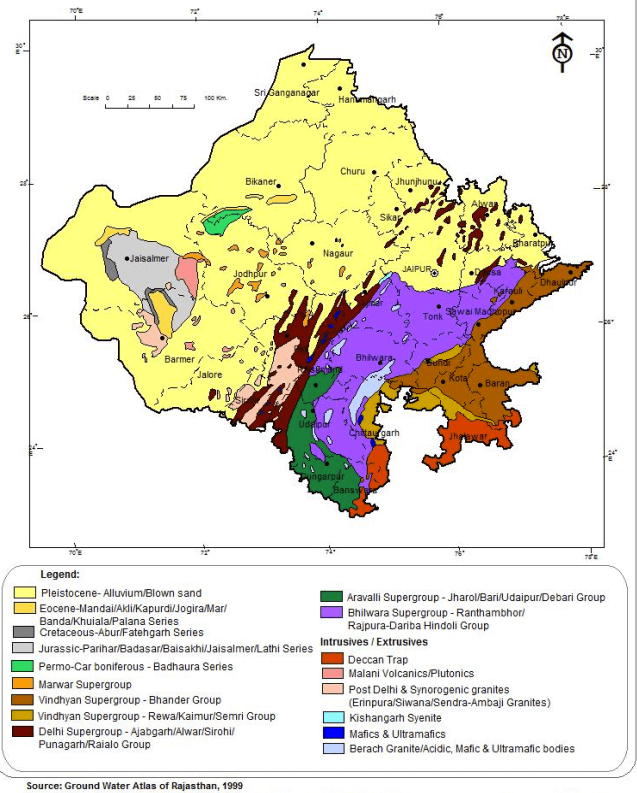 The northern and north-western parts of the State exhibit Upper Proterozoic-Early Cambrian rocks of the Marwar Supergroup which are overlain by sedimentary rocks of different ages of Palaeozoic and Mesozoic Era. Many industrial mineral deposits are found in these rocks. The Deccan Traps are restricted to the south-eastern part of the State in Chittaurgarh- Banswara area. The Cenozoic rocks are manifested in Barmer and Jaisalmer basins in the west and Ganganagar-Palana shelf in the north. The Quaternary sediments of aeolian and fluvial origin constitute the Thar Desert of Rajasthan.